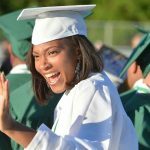 NEW HAVEN — The statewide high school graduation rate has broken another record, increasing to 87.9 percent for the Class of 2017. The news was announced by Gov. Dannel P. Malloy and Commissioner of Education Dianna Wentzell at Wilbur Cross High School at an 11:30 a.m. press conference. Cross had the third largest increase in graduation rate over the past five years of any Connecticut high school, reaching 81.3 percent in 2017, up from 64.3 percent in 2013, officials said. This is the seventh consecutive increase for four-year graduation rates. Last year, the state wide rate was 87.4 percent. Graduation rates for black and Hispanic students continued to increase, outpacing the average growth for the state. The graduation rate for black students reached 80.1 percent in 2017. For Hispanic students, the graduation rate reached 77.7 percent in 2017. Also on the rise, according to the state Department of Education, are the graduation rates for school districts that participate in Connecticut’s Alliance District program, mostly urban districts. The graduation rates for the Alliance Districts reached 80.5 percent in 2017, up from 71.2 percent in 2011. Bridgeport, as a district, saw a noticeable jump in its four year graduation rate, from 66.5 percent for the Class of 2016 to 74.5 percent for the Class of 2017. The only Bridgeport high schools to slip were Bassick, which went from 60.8 to 58.7 percent and Fairchild Wheeler’s Information Technology high school which went from 95.1 to 93.5 percent. Bridgeport’s Harding High, conversely, saw its graduation rate increase from 56.9 to 62.8 percent. Besides Bridgeport, other area districts showing graduation increases in 2017 include Ansonia, Danbury, Derby, Fairfield, Greenwich, Oxford, Shelton, Wilton and Westport. In New Haven, Cross Principal Edith Johnson called her school’s improvement a community effort. “Certain districts quite frankly don’t need us,” Malloy said, referring to towns like Darien and Westport. These rates represent the percentage of first-time, ninth-grade students who graduated with a regular high school diploma in four years or less. It is based on individual student-level data, excludes ninth-grade repeaters, late graduates, and accounts for transfers in and out of the graduating class over the four-year period. Of 42,508 students who entered high school the 2012-13 year, 37,365 collected a diploma four years later. Of non-graduates, 5.6 percent — or 2,380 students — were still in school. Despite the steady climb, state officials could not say whether the increase in diplomas equates to an increase in students prepared for college or careers. According to a National Assessment for Educational Progress 12th grade test given in 2015, just 50 percent of Connecticut 12th graders leave high school proficient in reading, while 32 percent are proficient in math. The the percentage 11th and 12th graders who do well on a college readiness exam has been increasing along with the overall graduation rate, Gopalakrishnan said.